Here's another post that's been sitting on my computer for awhile. I made this before Christmas! 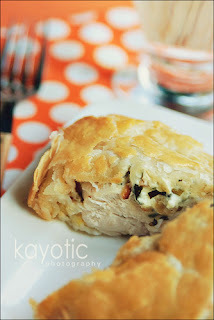 It's called Kaytucky Chicken and it can be found on Kayotic Kitchen. I am always looking for new chicken recipes, so I decided to give it a whirl. The Verdict: It was alright. I don't fault the recipe for it not being better, I think it was more my fault. I didn't give the dough enough time to defrost so I tried to defrost in the microwave. That made it super hard to work for, so I wound up with tons of pastry around each piece of chicken. Also, I bought large chicken breasts in order to have room to stuff, but I think it ruined the chicken to filling ratio (too much chicken). Things to Consider: I think I would attempt this again (although to be honest I haven't even thought about that in the 2 months since I tried it the first time). I would use smaller breasts though, and perhaps just wrap them around/fold them over the filling, Then wrap the whole thing in puff pastry (that's properly defrosted). I liked the flavors together, and the whole thing had potential, I just need to perfect my methods. From Kayotic Kitchen - she has some great pics of each step as well! Cook up your bacon (I used pre-cooked to save some time). Chop up spring onion and parsley. Add the spring onions, parsley, crumbled up bacon and a good pinch of pepper to 4 oz firm cream cheese. Mix it all up. Adding a little garlic, chili pepper and/or grated cheese also tastes great! Pop them in a preheated oven, and bake at 400F (200C) for 30 to 35 minutes. love your blog ...this recipe looks and sounds YUMMY!!! !